I’ve been conscious that in the last little while my recipes have been lamb, chicken or seafood. So thinking it’s time for a change I decided on roasted pork belly this week. 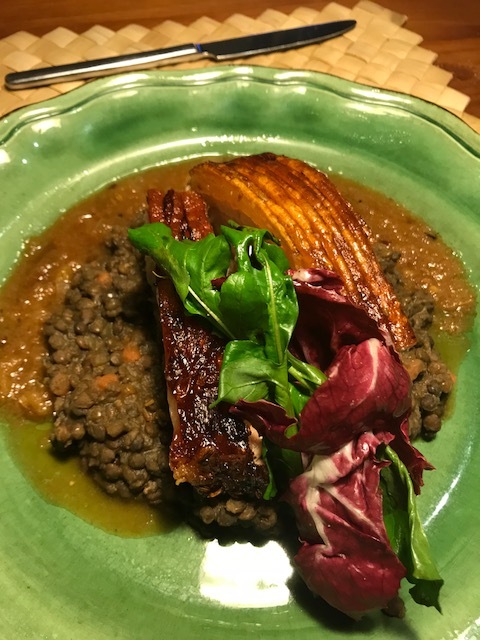 Following is the recipe which Emma and I teamed up with lentils in the French way. The small amount of pork left over was delicious the next day with a salad and red cabbage pickle which I’d also made. Early in the day or the night before, pound the fennels seeds and coarse salt in a mortar and pestle. Add the pepper and mix together. Score the pork belly skin with a sharp knife (I find a craft knife is easiest to use!). Make the slashes about 5mm apart. Rub the crushed fennel seed mix into the flesh, not on the skin. Wipe the skin dry and place the piece of meat in a dish that can go in the fridge. Leave it there so the skin dries out more, overnight or at least 5-6 hours. When you’re ready to cook, heat your oven to hot – about 240C. Place the sliced onions and apples on the bottom of a small oven dish with a little oil and place the pork in – skin side up. Cook for about 20-30 minutes until the crackling looks/feels done. Turn the oven down to 170c and add approximately 1-2 cups of the cider. Return the pork to the oven. Watch it occasionally for the next 2 hours. Add more of the cider if it starts to look as though it has mostly evaporated. I found we used about 1ltr of the bottle. After the 2 hours take the pork out and place it on another dish so it can rest. Skim any fat off the liquid that’s left and then using a potato masher or similar, mash the onions, apple slices and sage into the remaining juice. Simmer it quickly for a few minutes, taste and season with more salt and pepper if necessary. 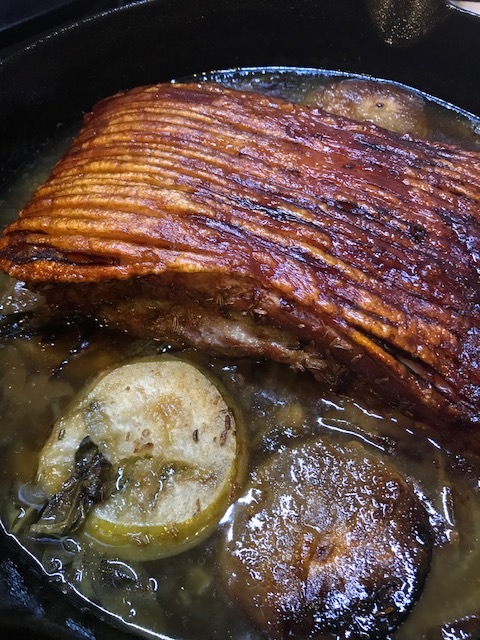 When you’re ready to serve the pork, place a generous amount of the sauce on each plate and top with slices of the pork belly and crunchy crackling. Serve this with cooked lentils and a green vegetable. 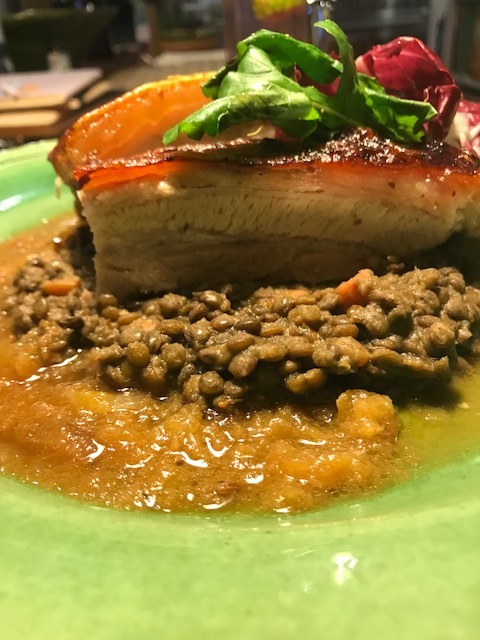 Let us know if you’d like a recipe for the lentil.